HCM CITY (VNS) — Chronic kidney disease (CKD), or chronic renal failure as it is also known, is a growing burden for many Vietnamese families. Dr. Nguyen Huu Dung of Bach Mai Hospital's Artificial Kidney Department, said that more than 8,000 new cases were reported each year. The number of patients nationwide currently stands at 6.73 per cent of the population or about 6 million people, of whom, about 800,000 patients (0.09 per cent of the national population) are at stage five (final stage). This means that they need renal replacement therapy through blood filtration (haemodialysis) or a kidney transplant to stay alive. But, Dung said, only 10 per cent of stage-five patients could afford haemodialysis while the rest had to face a grim future. Meanwhile, a report by the Department of Health Examination under the Ministry of Health, said all the centres that did blood filtration were overloaded and could not handle all the work. Dr. 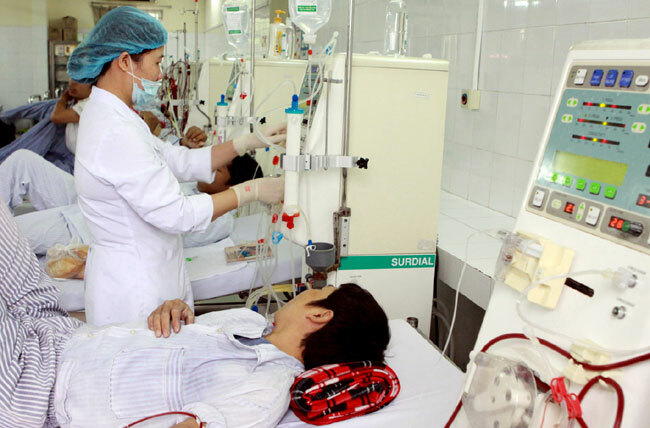 Vu Le Chuyen of Binh Dan Hospital in HCM City said that most CKD patients were not aware that they suffered from CKD until 90 per cent of the kidney function was lost. This is because a deficiency of blood, caused by CKD, occurred slowly, thus going unnoticed, Chuyen said, adding that the more critical the shortage, the more serious the disease. This was the reason the Health Information and Education Centre under the HCM City Health Department held a seminar Understanding the deficiency of blood in patients last Thursday. The seminar was an opportunity for CKD doctors to educate the general public about CKD as well as how to detect the disease at early stages and to keep it from getting worse. Appetite loss, general ill feeling and fatigue, headaches, itching (pruritus) and dry skin, nausea and weight loss without trying.